Weekly Pokemon Broadcasting Station #009: "Do Your Best! Look Ahead Rocket-Dan?" Pokémon Chronicles Episode 07: "We're No Angels!" After being sent hurtling through the air by one of Pikachu's attacks, the Rocket-Dan land in a village being terrorized by an evil scientists' robots. The trio mistakes the robot as a helper robot and attacks it, thinking that they will be feared by the villagers for taking it down. However, they are surprised to learn that their actions have caused them to become adored as heroes! It turns out that the villagers think the Rocket-Dan are a trio of heroes called the Suketto-Dan, a group of movie characters who resemble the three thieves. The villagers beg them to go to the scientist's hideout and bring down his robot army once and for all, so Musashi accepts. She tells her shocked teammates that if they help the villagers now, they'll allow them to set up a Rocket-Dan base in their village in return. With an ulterior motive in the back of their minds, the Rocket trio heads for the scientist's castle and are shocked when they see that the man the villagers have been so afraid of is very meek and timid! The scientist, Brown-Hakase, tells our heroes that his robots were meant to help people and become everyone's friends, but his creations are misunderstood. Brown-Hakase is able to prove his good intentions by helping the Rocket-Dan rid the village of a flock of Subame. However, he takes the spotlight away from the Rocket-Dan in the process, thwarting their plans to become the heroes of the village! As the trio bemoans their fate, Kojirou accidentally hits a button that sends their mecha blasting off again! They land in a forest where Satoshi and his friends are traveling, so they abandon their short-lived attempts at being heroes to do what they do best: catch Pikachu! The Rocket-Dan centered episodes were always a treat in the regular series, and the same is true for this one as well. Seeing the Rocket-Dan in a situation where they're adored as heroes is pretty neat, and watching an episode full of mecha (including the Nyasu mecha as an homage to Mazinger Z...pay particular attention to the Jet Scrander) is always fun. The only thing I didn't really like about this episode (other than horribly off-model animation) was the romance between Kojirou and Rose. It seemed so incredibly forced and last-minute and really does nothing for the overall plot of the episode. I mean, it's great for people who are clamoring for evidence that Kojirou isn't gay, but other than that it brings absolutely nothing to the episode. The dubbed version is...surprisingly good. The script is as accurate as the main TV series is, and there isn't a bit of digital paint or a single video edit in the whole thing. They even left the wine glasses during the dinner scene untouched. The only thing about the dub is that it had an annoyingly high number of time edits. Seriously, I was happy if I could go ten seconds without having to pause the video to record a one-second cut here or a four-second cut there. And I thought "Hoenn Alone" was a painful episode to record edits for. For your reference, this episode was released between episodes AG 004, "Full of Subame, Full of Peril! I Got One in the Forest of Touka!!" ("You Never Can Taillow") and AG 005, "Zigzaguma and the Short-Pantsed Boy! Haruka Battles for the First Time!!" ("In the Knicker of Time!"). In the Japanese version, Maemuki Roketto-Dan is used as the episode's ending theme. Arbok keeps its Japanese voice. And you know who else does? Brown-Hakase's flower delivering robots. You know, the ones who say "Welcome~ Welcome ~ Welcome ~ Cha Cha Cha!" How crazy is that??? All the music in this episode is replaced in the dub, bla bla bla...EXCEPT for the Rocket-Dan's motto music. That and the episode's title screen music are kept, but everything else is replaced by 4Kids' staff of "talented" composers. Oh well. Time to break out the old thesaurus! A second is cut from the far-away shot of Professor Brown's castle. A second is removed from the far away shot of the villager hitting the bell over and over. The very next shot - the one with all the townspeople in it - has the last five seconds removed. As a result, dub viewers don't get to see a bunch of the villagers who were originally shown at the top of the pan. A second is shaved from the shot of the sky after Kate's "Please come save us, angels of justice!" A five second shot of the Rocket-Dan flying through the air after the episode's title screen is completely removed from the dub. The shot of Kate addressing the villagers ("Superheroes who fight against injustice, evil, and wickedness!") is four seconds longer in the Japanese version. The shot of the Rocket-Dan before releasing their pokemon to battle is shortened by two seconds. 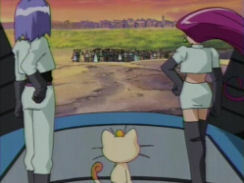 A five-second shot of the Rocket-Dan looking over the villagers after defeating the mecha is completely removed from the dub. A second is trimmed from the establishing shot of the convention center...place where everyone watches the movie featuring the Suketto-Dan. The shot of the lights turning back on is a second longer in the Japanese version. The shot of the Rocket-Dan scheming before the first shot of the Nyasu mecha is shortened by five seconds. Two seconds are excised from the shot of Kate saying "Oh James...please be careful!" 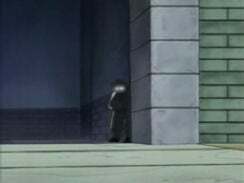 A two-second shot of Brown-Hakase up against the wall is completely removed from the dub. It happens right before the close-up of him pushing a button on his remote control. A second is cut from the shot of the professor running up to the Rocket-Dan pleading for them to spare his robot. A second is cut from the shot immediately after the previous cut. Three seconds are trimmed from the shot where Professor Brown says "A villain!? I'm not a villain!" The very next shot (the one with all his robots) is a whopping eight seconds longer in the Japanese version. Two seconds are shaved from the shot of Professor Brown watching his robot leave the castle. A second is cut from the very next shot, where we see the wall in front of the professor fade away. Two seconds are cut from the shot of the lab right before we see the villagers again. A second is excised from the Rocket-Dan's shocked reaction to the flock of Subame coming their way. Two seconds are trimmed from the scene where the Rocket-Dan's mecha comes to a halt as the Subame pecks at the hull. Two seconds are removed from the first shot of Professor Brown's red-winged mecha. A second is cut from the very next shot...the one where we see the launch ramp raising up. A second from the scene where Team Rocket says "We're flying! It worked!" is removed. Two seconds are removed from the shot of the Nyasu mecha in that Superman-like pose. 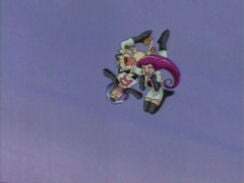 A second is removed from the shot of the Nyasu mecha stopping in mid-air. Four seconds are trimmed from the first shot of the scene that takes place later that night. Two seconds are trimmed from James' "Kate...wait!" A second is removed from the very next shot of the Nyasu mecha. Kojirou's finger lingers over the buttons inside the mecha two seconds longer in the Japanese version than he does in the dub. A second is removed from the launching of the aforementioned mecha. A second is taken away right before the shot of the Rocket-Dan blasting off. The final shot of Rose is a second shorter in the dub. Two seconds are trimmed from the final shot of the episode.